New York (AP) – When I brought home review models of Amazon’s Echo speaker, a sort of smart, voice-controlled speaker, and two Dash buttons that reorder household products with a single touch, I wasn’t convinced I’d find them all that useful in my daily life. I was half right. In many respects, it was surprisingly easy to get sucked into Amazon’s services. Before I tried out the Echo, for instance, I wouldn’t have dreamed of spending $180 on the device. After having it around, I might still pause, but I would put it high on my Christmas list. The Dash buttons didn’t do so much for me, although I can see how they might be useful for some. Amazon began rolling out the Echo in late 2014 and started selling it broadly in June. It’s one more way for Amazon to entice people into its $99-per-year Prime loyalty program and to buy more stuff from the online superstore. Although Echo doesn’t require a Prime membership, some of its functions – such as, naturally, reordering products from Amazon – won’t work without one. 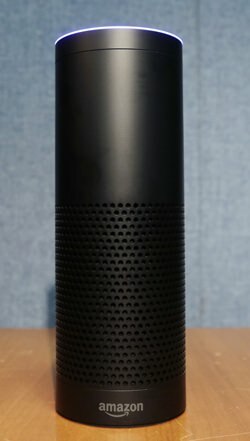 In many ways, the Echo’s Alexa is similar to Apple’s Siri and the Google Now voice assistants. But when my phone is in my hand, I find it easier to just type. On the other hand, it feels more natural, and even fun, to speak to the Echo from around the room. And it seems to understand my voice more often than Siri or Google does, although the Echo still had problems occasionally. Although Echo has an “always on” functionality, Amazon says it’s not really listening until you say “Alexa” – an assertion you basically have to take on faith. A blue ring appears at the top of the cylinder to let you know it’s ready to take commands. You can then ask the device to perform any number of tasks. When you’re cooking, it’s a snap to set a timer. Just say, “Alexa, set timer for 10 minutes,” and the timer starts. You can ask it how many minutes are left, too. It can also convert measurements, such as ounces to cups. Saying “Alexa, play WNYC” gets me my local public radio station online through TuneIn. The Echo syncs with Prime Music, too, so you can play any song in that library. Request an artist, like Beyonce, and it picks a Beyonce song from Prime Music at random. Echo can also give you a quick snapshot of the weather before heading outside. It can answer queries with information retrieved from Wikipedia or add items to shopping or to-do lists. Amazon is adding new features and functionality almost weekly, so you can tailor the device to your tastes, by enabling services via the app, no matter how esoteric. For example, you can enable a “Cat Facts” skillset that provides cat trivia. Alexa can even tell Donald Trump and Hilary Clinton jokes taken from Seth Meyers’ and Jimmy Fallon’s late night shows. Amazon recently extended its Alexa software to additional devices, including the Fire TV streaming TV gadgets. As a Brooklyn-er with a small apartment, I didn’t find much need for the “connected home” side of the Echo, which can turn certain “smart” light bulbs on and off. It also works with some garage door openers and other connected-home devices. For now, you can’t shop with Echo, apart from reordering some products you’ve ordered before. That’s where the Dash buttons came in. You affix them around the house to reorder items with the press of the button. Amazon offers buttons for 29 brands, from Bounty paper towels to Tide detergent. When you get a button for that particular brand, you choose what specific product and quantity will come when you press the button. The buttons are basically free – you pay $4.99, but get a $4.99 credit toward your first order. Like Echo, Dash is easy to set up using an app. You can’t beat the simplicity of pushing a button when you need a product – in my case, Ziploc bags and Clorox disinfectant wipes. The orders came as promised within the delivery window of three to five days. You can set it so a second order won’t get processed until the first one arrives. That way, you won’t inadvertently get double the toilet paper when you press the button twice. You get free shipping with Prime, which is a requirement for Dash. I can see these buttons being useful for busy families: diapers on demand might be a godsend for a new mom. But personally, I don’t buy household items often enough to need the Dash. Amazon just announced that it is letting product makers build in Dash technology, so a coffee maker can automatically reorder more coffee. That might make more sense in my apartment. Dash shows promise, but it’s not yet where it needs to be. The Echo, on the other hand, seems ready for Prime time.